SkyBell is a Wi-Fi enabled video doorbell that comes with an app that allows you to see who’s at your door (and talk to them) through a live video feed to your iOS and Android mobile devices, even if you are in another country! 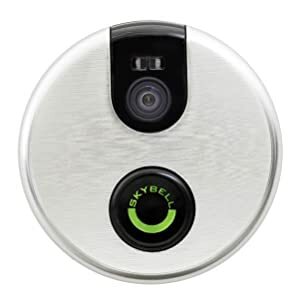 SkyBell requires full-time power and is designed to be connected to a wired, mechanical doorbell chime. This means installation is a pain, and we wish they would simply make a battery-powered version you could stick anywhere. apartment dwellers cannot use the device, because of the above. image quality is not the greatest. The product retails for about $200, and you can get it on Amazon . For those of us who want a bit of color in time for Graduation without exposure to dangerous UV rays, Tropic Spa Home Mist Tanning System promises a solution. The way the system works is pretty ingenious. You first charge the unit’s batteries (takes about half a day), and then load it up with six cans of a special spray liquid, composed of DHA plus skin moisturizers and conditioners. Then you hang the unit from a door, such as a bedroom or bathroom, and stand in front of it. After activation, the unit starts to spray all six cans simultaneously, and beeps indicate the speed at which you should be turning to ensure full and even coverage. After being sprayed, you use the included plastic gloves to spread it around to spots that might have been missed, such as the tops of your feet, behind the ears, the neck, etc. and that’s it! After a few hours, the chemicals set and you are tan! The system retails for $334.95, but if you would like to try the system they are offering a special for $249 through the end of June 2015. “Keep Fresh, Stay Rad” 100 Cool & Funky Postcards Giveaway! With everybody texting and tweeting these days, communication often lacks the personal touch. A new set of postcards by a bunch of hip designers from both coasts can help bring some of that back, however. Keep Fresh, Stay Rad by Friends of Type is a set of 100 cards featuring epic designs and messages inspired by everything from 1980s pop culture to skateboarding. Use them for any occasion, or simply to impress someone who’s Twitter feed is just too bloated to notice you. Also included is a 24 page booklet where the designers share some of their creative processes. You can buy the product here, or win a box of Keep Fresh, Stay Rad from Teens Wanna Know! Scroll down for instructions! Contest is open to U.S. addresses only. We will pick one (1) random winner on 10/04/14. Winner will be notified by DM on Twitter, so must be following @teenswannaknow in order to be eligible to win. Deejaying a small get-together wirelessly using an iPad or smartphone seems like a pretty cool idea, right? Well, check out this Bluetooth beauty from Tego Audio which allows you to do just that. The CERA Wireless Portable Speaker from Tego Audio quickly pairs with your device and delivers big sound from a small, futuristic-looking device. The CERA is available in black, white and red. Pricing is $89.99 for a single unit, or you can purchase a three-pack for maximum value at $199.99 with any combination of colors.